In response to cost and competitive pressures, many publishers are producing Bibles in China. Fireside Catholic Publishing cannot with good corporate conscience, produce Bibles in a country where Roman Catholic clergy are regularly arrested and jailed, and government-sponsored persecution of Roman Catholics and the Catholic Church in China continues. Ten million of China's estimated 15 million Catholics are Roman Catholics who, in order to remain loyal to the Holy See, must practice their faith underground. It is widely reported that hundreds of Roman Catholic clergy have been imprisoned, are under strict government surveillance or are missing altogether. The remaining one-third of Chinese Catholics are part of the government-sanctioned Chinese Catholic Patriotic Association (CCPA), which has no formal ties to the Vatican. The practice and membership of the CCPA is closely monitored and regulated. We encourage all Bible consumers to make their own decisions regarding the origin of the Bibles they purchase. Fireside Catholic Publishing will continue to offer the highest quality Bibles at the best possible prices, and will only produce Bibles in countries where all people are allowed to freely practice their faith. 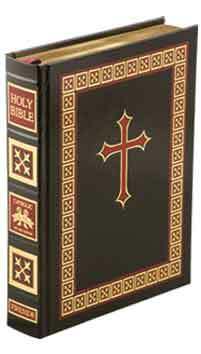 Visit our Catholic Bible Store to select your bible. All content of Fireside Catholic Bibles, Wichita, KS, has received Imprimatur from the appropriate Ordinary and is approved for publication by the Board of Control of the United States Conference of Catholic Bishops. All ancillary material created to assist the reader, is clearly delineated from the Scripture text by the color and placement of this material. Fireside has and will continue to seek ecclesiastical approval on products we publish.